Tech blog AllThingsD was one of several companies forced to cancel New York events this week due to the weather. Silicon Valley is the national technology hub, but New York gets its share of tech events -- and many of this week's were canceled in anticipation of Hurricane Sandy pounding the East Coast. New York City has declared a state of emergency, and public transportation was suspended starting at 7 p.m. Sunday. Flooding and power outages throughout the city are a concern. Google (GOOG) was the first to spike its New York event, a mobile announcement planned for Monday morning. The company was expected to unveil a new Nexus smartphone and tablet. Google's Android team sent an email to attendees on Saturday afternoon, saying "we will let you know our plans as soon as we know more. Stay safe and dry." 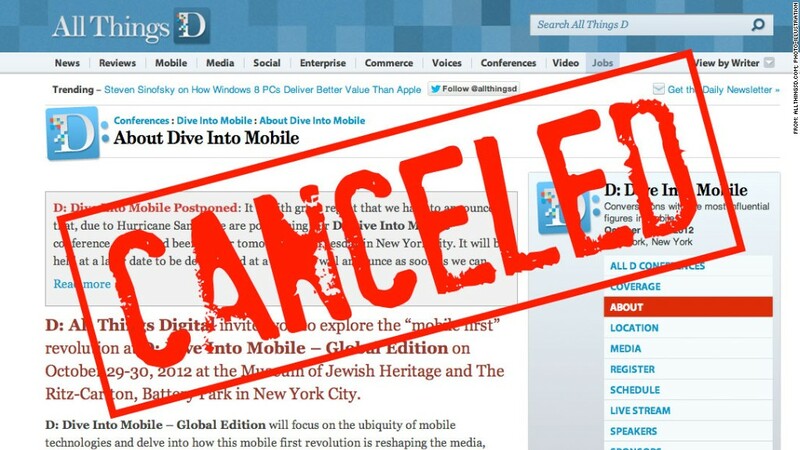 Tech blog AllThingsD was next to pull the plug, canceling its D: Dive Into Mobile conference in a blog post published Sunday afternoon eastern time. The conference was scheduled to take place Monday and Tuesday in the Battery Park section of downtown Manhattan, a low-lying area that was declared an evacuation zone on Sunday. "The situation is truly out of our hands," the conference moderators wrote. They said Dive Into Mobile will be rescheduled at some point, and tickets will be honored. Would-be attendees can also opt to use their tickets for AllThingsD's media conference, scheduled for February in California, or receive a full refund. Facebook (FB) is the third company to forgo its New York plans this week. The social network deep-sixed its plans for an engineering open house on Tuesday, plus an event for Facebook Gifts -- a feature that lets users send friends real, physical goods -- that was slated for Thursday. AllThingsD reported those cancellations, and Facebook did not immediately reply to a request for comment Monday morning. Another Facebook cancellation of sorts: Many employees were supposed to get their first chance to sell their company stock on Monday, but instead stock exchanges were closed due to the hurricane. Facebook's current and past employees hold about 225 million restricted stock units that converted into real, trade-able shares last week. Adding in other stocks and options that were also unlocked, a total of 234 million shares were supposed to be newly eligible for sale Monday. Back in sunny, 70-degree Silicon Valley, the tech world is functioning as usual. Microsoft (MSFT) is expected to unveil its Windows Phone 8 at a San Francisco event later on Monday.